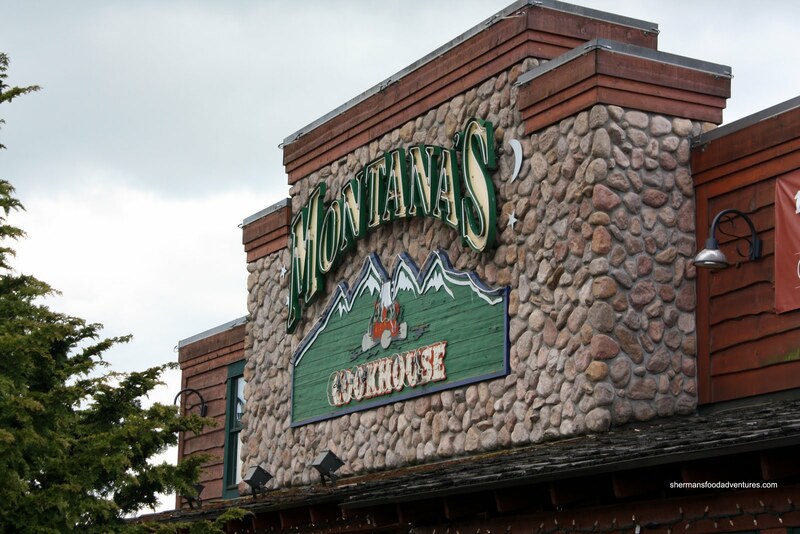 It was roughly a year ago that I last visited Montana's out at Coquitlam Centre. I find that with most people, it is a love or hate relationship in regards to the food. Why such a polarizing sentiment? I guess it is partially due to the menu itself. After all, it is not a vegetarian-friendly place. With a giant moose head hanging from the wall, this is probably a vegetarian's worst nightmare (other than Samba). In fact, if it's your birthday, you'll be presented with a moose antler helmet while they sing "Happy Birthday" to you. 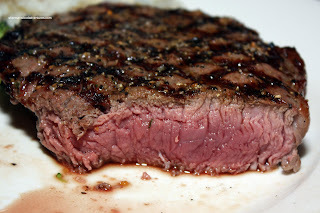 So for those who are not meat lovers, it is quite obvious that the food needs to be outstanding for them to even tolerate it. Much like how a vegetarian meal must absolutely blow me away in order to not elicit gag-like reflexes. So I totally get where people are coming from. To further complicate matters, being a chain restaurant, Montana's doesn't have that "originality" factor. To many, it's a ho-hum place that serves up generic food. Now by virtue of being a chain restaurant, you'd assume there would be consistency. Yes and no. Definitely the decor is consistent, as well as the service and attire. 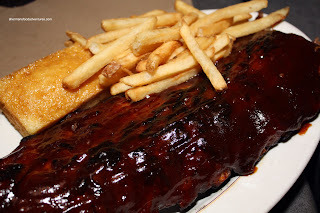 However, from my personal experience (having eaten at Montana's a g ood dozen times), the star of the show - the ribs - can be hit and miss. Sometimes, they can be super tender and very meaty. And at other times, they can be charred beyond recognition and stringy. For their sake, I really hope they can fix that because it annoys me. Furthermore, for those who don't admire meat on bones, it could be the last time they visit Montana's if that was the case. Today, we had a fairly large group visiting the Langley Bypass location. 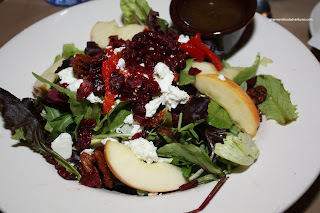 We weren't really planning on such a carnivore adventure for lunch; but Olive Ga rden was packed. I still really can't figure out why that is either... Maybe it has something to do with it being the only location of Olive Garden in BC? Anyways, Montana's was empty and that suited us fine. I guess a full rack of ribs for lunch may or may not be that attractive compared to a plate of pasta with AYCE salad and breadsticks. Honestly, I'd rather go to East Side Mario's instead. They have soup and choice of salad. I digress. 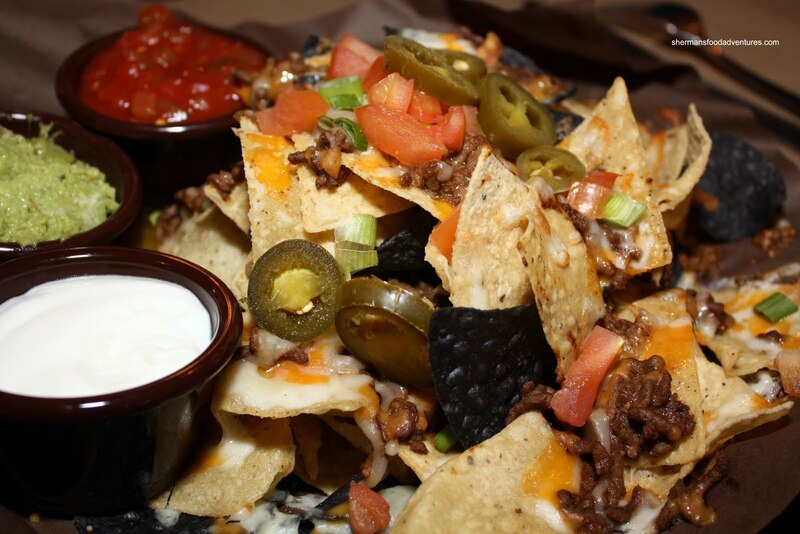 We started with the Beef Nachos to share. Not a really exciting dish to talk about; but they were good. The chips were thin and crispy, lots of beef and fresh toppings. However, they were a bit stingy with the cheese. So for this visit, I decided to do something different as in the Beef Short Ribs. Now, unlike the short ribs you'd normally see at a Korean restaurant, these big bones are not cut across the bone into thin slices. Rather, they are cut lengthwise with all the meat intact along the long rib bone. Thus, the meat is able to retain quite a bit of moisture and flavour. These bones were massive. Think the Flintstones. I felt like a barbarian eating those ribs. I got 2 and I swear each of them had at least 12 ounces of meat on them. As mentioned, the meat was extremely tender and moist. There was a good smoky char on the outside and just enough BBQ sauce to provide the necessary flavour (in this case, I go the Apple Butter). Either I'm completely losing it or I'm a wimp. I could only finished one of them. Juan Valdez went for the 12oz Sirloin Steak prepared medium-rare (more to the rare). 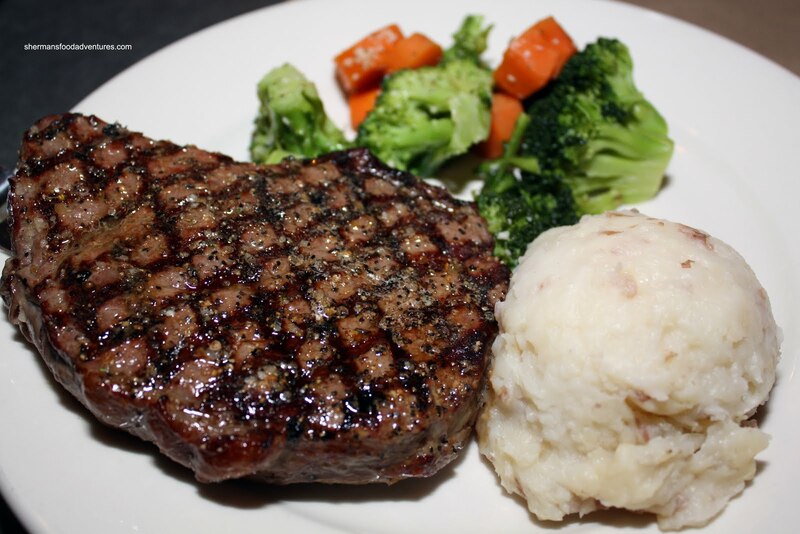 As you can see, there are perfect grill marks on the outside and absolutely flawless execution on the inside. It was tender, juicy and full of flavour. He devoured it so quickly, I'm amazed I even got a chance to take a picture of the cross-section. On a side note, the veggies on both my order and his were still crunchy while cooked completely through. Pomegranate went for the classic - Pork Baby Back Ribs. This time around, the ribs were tender, not overly fatty and nicely charred on the outside. I wish the ribs would turn out like this every time. 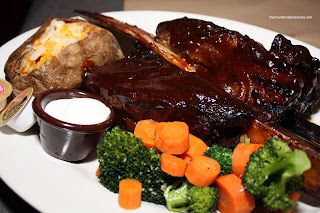 Unlike the ribs at places such as Memphis Blues and Ozark's, the ribs here are precooked prior to BBQing. Thus, they are usually quite moist. Sacrilegious if you were to serve this to true Southern folk, it works for me at least since I don't prefer dry ribs. On the topic of sacrilegious, Hot Mama opted for the Apple Pecan Harvest Salad. I am beginning to think that she can give Miss Y a run for her money in terms of ordering the wrong items at restaurants that specialize in a particular type of food. With that being said, everything was fresh and there was no absence of flavour and texture. She enjoyed it and didn't even want to eat meat! 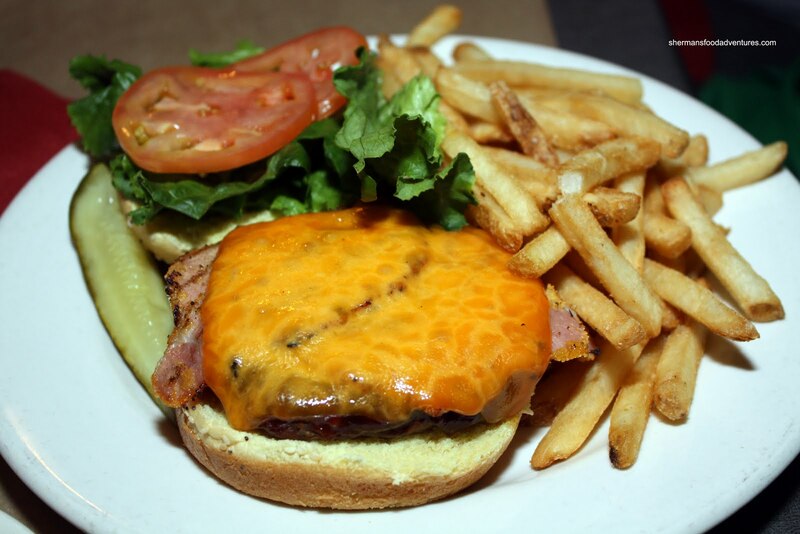 Fortunately, to exorcise the demons that possessed her to order a salad, Double H went for the Great Canadian Burger. With bacon, cheese, and BBQ sauce, it was a pretty decent burger. Nothing ground-breaking; but it does the job if someone wanted a burger here. The fries were forgettable though. It was your standard frozen fries. Something that I've never had here are the Sizzling Chicken Fajitas. Probably since I come here for the ribs, I don't pay attention to anything else... I didn't get a chance to sample it, but it looked alright. 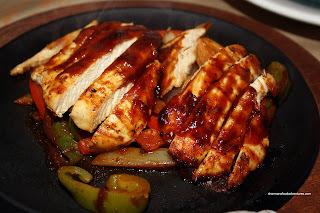 No better or worse than any other chain restaurant fajita I've seen in the past. And of course that sums up Montana's quite nicely. Nothing ground-breaking; but it does satisfy the meat-cravings. I personally like the place; yet there have been times the food has not come out the way I would've liked. But, similar to Olive Garden, I don't understand the hype of a lot of frozen yogurt places anyway so you are not alone on that one!